Carte de la Barbarie de la Nigritie et de la Guinée [Map of Barbary, Nigritia and Guinea]. Large antique 18th century atlas map, printed on thick, good quality paper with original outline hand colour/color , 1745. Title of the map:'Carte de la Barbarie de la Nigritie et de la Guinée [Map of Barbary, Nigritia and Guinea]. The image below shows an enlarged cross section from the centre of the map to show the level of printed detail. This map is folding hence the centrefold line may show on the image below. 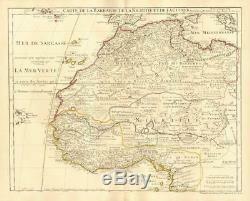 This eighteenth century map shows West Africa, divided roughly into Barbarie (Barbary), Nigritie, and Guinee (Guinea). The Azores, Canary islands and the Cape Vedre islands are also marked. Reflecting the lack of European understanding of West Africa's rivers at the time, the Senegal and Niger river systems are shown incorrectly on the map as being a single river system, flowing west from a source located approximately in modern Chad to Saint-Louis, Senegal the Niger river in fact flows east before turning south to empty into the Gulf of Guinea. The river system includes a great lake, marked as both "Lac de Guarde" and "Lac de Sigismes", which was probably an early attempt to map the Inner Niger Delta. There is also a fascinating comment on the map stating in French that "some people believe that the Niger is a branch of the Nile", a popular theory at the time. DATE PRINTED: Originally published by Guillaume de l'Isle 1707; updated and republished by Philippe Buache 1745 (These dates are printed on the map). IMAGE SIZE: Approx 53.5 x 66.5cm, 21 x 26 inches (Large); Please note that this is a folding map. ARTIST/CARTOGRAPHER/ENGRAVER: Guillaume de l'Isle. PROVENANCE: The map was extracted from a "Composite atlas" of early 18th century maps, the latest of which was dated c1754. TYPE: Large antique 18th century atlas map, printed on thick, good quality paper with original outline hand colour/color. VERSO: There is nothing printed on the reverse side, which is plain. CONDITION: Very Good; suitable for framing. Virtually all antiquarian maps and prints are subject to some normal aging due to use and time which is not obtrusive unless otherwise stated. AUTHENTICITY: This is an authentic historic print, published at the date stated above. I do not offer reproductions. It is not a modern copy. The term'original' when applied to a print means that it was printed at the first or original date of publication; it does not imply that the item is unique. Print' means any image created by applying an inked block to paper or card under pressure by any method including wood engraving, steel engraving, copperplate, wood cut and lithography. REMARKS: FRANCE: Gravures et Cartes anciennes. DEUTSCHLAND: Alte Lankarten und Stadt ansichten. ITALIA: Stampe e Mappe antiche. ESPAÑA: Mapas antiquos y impresiones antiguas. The item "La Barbarie de la Nigritie et de la Guinée'. DE LISLE 1745 map" is in sale since Sunday, March 19, 2017. This item is in the category "Art\Art Prints".